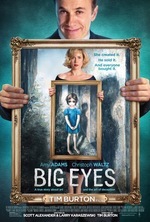 "Big Eyes brings a bunch of conflicted feelings, which the movie accounts for in its comic yet disturbing tone. It's the story of an artist trying to break free, but the artist isn’t exactly Van Gogh. This is art no one respects... and yet you kind of like it, don't you? (No? You won't admit it? Must I go first?) It's also a story that feels emblematic of its time, in that it's hard to imagine an intelligent, gifted woman of our era allowing herself to be steamrolled like that. "The script, by Scott Alexander and Larry Karaszewski, walks the line between the serious and the satirical, maintaining some distance but leaving enough truth for the actors to invest in. The casting is ideal. Amy Adams just has to look at a canvas, and you believe that she's feeling something, and what a miracle of an actor Waltz is, to be so funny and alarming at the same time, and in so many different ways. "Tim Burton fashions the perfect frame around these actors and then lets them fill out this marvelous creation." Margaret Keane entry at Wikipedia tells more about her life. Gallery owner: "Who would want credit?" The cynic in me suspects that LaSalle liked it so much partly because it's largely set in San Francisco; and because it very vividly recreates its period setting. Amy Adams is good in this; Christoph Waltz is *amazing* in it. We had a deal, Kyle, I felt exactly the opposite about the performances. I thought Waltz oversold Keane, making him seem rather untrustworthy from the beginning, and I couldn't really get why Margaret fell for his scheme right off the bat, except for Amy Adams' low-key acceptance that she wasn't really the free-spirited artistic soul she thought she was. When she met with the Jehova's Witnesses for the first time, you could see that light flashing in her eyes, and I just loved the subtlety of it. Also, I liked the film for taking her faith seriously but not pounding us over the head with it. She found what worked for her, and that was enough. We had a deal, Kyle, I don't believe those are bad reasons to like a film. KQED has a great interview with Margaret Keane that makes a good introduction to the film (which I haven't seen). What I saw in it was how important religion was to her as a motivator (rather than, say, feminism as a movement), and how the trailer and selections I've seen show that honestly and respectfully. The interview also shows, briefly, some art of hers that is less iconically focused on the big eyes, and is more interesting for it. Yeah, that's why I called myself cynical. I liked the film a lot and clearly LaSalle did too. I saw Waltz's performance as a portrait of a narcissist: his Keane was superficially charming and sociable, but self-centered and unempathetic, privately monstrous. His success seemed less about the money, far more about establishing and maintaining an image; so challenges to his artistry became attacks on his very self-image. The nightmarish scene in the supermarket seemed a bit unnecessary to me, albeit very Tim Burton-ey; and I liked the sly nod towards Warhol of Margaret very briefly picking up a Campbell's soup can. It felt like the least 'Burtonesque' Tim Burton film I've seen. Even Ed Wood had the occasional flair that made me go "This is a Tim Burton film". This, it was pretty much the opening short of suburbia and maybe the supermarket scene. However, this was what we needed from him now - when you get to the point that College Humor can make a joke about you, it's time to try and find something new. And although it touched on several of the visual styles that he enjoys (mid-century architecture and kitsch art), it felt so removed from his general body of work that it could have been made by almost anybody. And yet, no one else would have made this film. No one else would have seen the beauty and the drama inside something considered so bad. This is why Ed Wood worked so well, and although Big Eyes isn't as amazing as Ed Wood, it still shows that Burton can still hit the right notes for me. Amy Adams is fantastic as Margaret - she's always been good playing the naive, but her slow slide into cynicism was also well played, showing that, even after everything, she still had hope. Christoph Waltz was also fantastic - a lesser actor would have been eating the scenery from the first meeting, and he did get a bit scenery-chewing from time to time, but he did rein it in rather remarkably. I didn't adore it, but it's the best Tim Burton film I've seen in a very very long time. And it gives me hope that he'll make even more fantastic films. Except I just looked at IMDB, and they've announced Beetlejuice 2, so...maybe not. Christoph Waltz was a-mAZing in this film, really nailed the fragile ego thing - flying into outrageous speeches that are ridiculous at the same time as they're frightening. Absolutely spot-on for that character: half overblown clown, and half little Hitler. Amy Adams had the harder role in maintaining audience sympathy; she needs to portray being a victim without turning off the audience - I think she did an admirable job. I really liked the moments of intimacy between mother and daughter, nice to see on film, if fleeting. Along with Birdman, a film with a major role for a New York Times critic and their all-important review. I liked it, but I wished it had made it's mind up about what it wanted to be - sometimes I felt like Adams and Waltz were acting in different movies. It did have my most-loathed movie cliche, the child who acts like a mini-adult, which isn't even a trope here, just laziness. Why can't kids in Hollywood films ever act like kids anymore? /Old Man Shakes Fist at Cloud. I love the two LDR songs written for the film. Just the kind of dreamy pop I need this winter. The scriptwriters are guests on the most recent episode of The Dana Gould Hour*, and they talk about the importance of art to Margaret and how she developed her own, second style of painting that was "hers."